What a fun weekend! But, i'm excited to get back into the groove of things. My home has been seriously neglected. I feel like organizing and sending lots of things to the D.I. Did you all have a good weekend? I sure hope so. What is on your menu this week? Roast, Mashed Taters and Whole wheat dinner rolls. So excited for this!!! It's such a gloomy, chilly, rainy day...perfect weather for baking! LOVE IT! Breakfast for dinner. Bring on the WAFFLES!! Grab and Growl night! WOOOT! Hope your week goes great! And I think Monica will be back this week. YAY! :o) Can't wait! Also, I got my new camera!! Can't wait to try it out and post the pictures. Wish me luck!! Have an awesome Monday! Once again, all sounds good! 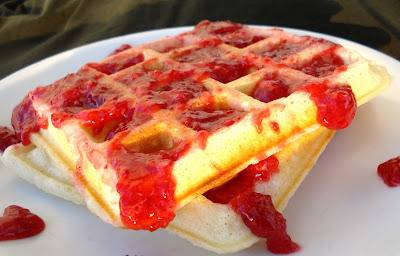 Especially the waffles...I love breakfast for dinner.